Lemons are primarily used for their juice, as a souring agent, to refresh the taste of foods, or to prevent food browning. Lemons weren’t really available at all to Europeans or North Americans until the end of the 1800s, and then only to the rich. For everyone, they were a special treat, and vinegar was used as a souring agent instead, because outside Italy and Spain, lemons aren’t “natural” in the Northern Hemisphere. Commercial bottled Lemon Juice can be handy to keep in the fridge.Granted, you won’t want to make lemonade from it or anything in which it is going to be the featured amongst few ingredients, but it’s fine in something you are baking, cooking or preserving. 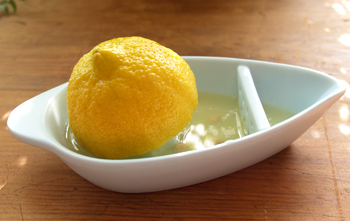 Juice a Lemon when it is at room temperature. Or, zap in a microwave from 10 to 30 seconds, depending on the power of your microwave. Until you have tried it a few times with your microwave, be cautious: you want to “loosen” the juice, not boil it. Then, press down on it on your countertop and roll it a bit to loosen up the juice. When you want just a few drops of juice, poke a hole in the Lemon with something like a toothpick and squeeze out what you need. Then use the toothpick to plug up the hole, put the lemon in a plastic bag, and put back in refrigerator.